Interesting article about Castlebar born priest, Cannon Joseph Joseph Canton P. P. V. F. Athenry 1891-1920. This biography is by Ronan Killeen from the Athenry Local History blogspot. My own interest is due to the Hoban connection with Linenhall & Tucker Street. I will write a short biography of who this hall is in memory of first. Cannon Joseph Canton was born in 1850 in the parish of Aglish, Castlebar Co. Mayo in Linenhall Street. His father Michael Canton, who was a teacher in the 1850's in a small school prior to the De La Salle School. Cannon Canton's mother was a Sarah Mc Loughlin. He was the eldest of five children. Subsequently two of his sisters lived with him in Athenry; one predeceased him and the three are buried together on Rathcruacha in the New Cemetery. Patrick Canton, an uncle of Joesph taught in a school built by Rev. Denis Egan on the site where later the De La Salle Monastery was built and is presently a residents for the priests of the parish. Cannon Canton despite growing up in the famine era went to school in St. Jarlath's of Tuam. He continued his education in the Irish College in Paris on the 22 September 1871 to study for the priesthood. The college itself had previously been closed from the 28 August 1870 on account of the Franco- Prussian war, and re-opened on the day Canton entered. It was on the 8 November 1874, Canton was finally ordained as a priest by Archbishop John McHale in the Tuam Cathedral. In St. Jarlath's College he became Professor of the Second Department of the Humanities and his teaching subjects were Science, History and French. After his second year in the college Canton was sent to the parish of Killascobe - Menlough in 1876. Cong in 1877; the Cathedral in Tuam 1878-1890; were he was Curate and appointed Administrator in 1888. Life was not always easy for Canton in Tuam due to the poor relationship between Archbishop McHale and Bishop McEvilly who had been appointed his Co-Adjutor and would take over the diocese on his death. McEvilly, was then appointed Co-Adjutor Bishop of Tuam on 7 January 1878 and Archbishop McHale died on 7 November 1881. As Ireland - was a time of the Land League era in the 1880's, Canton who was now the new Catholic Administrator and his predecessor Rev. Michael O'Connell who was then President of St. Jarlath's College Tuam attended a meeting of the Irish National League, and a banquet in honour of the Irish Parliamentary Parties - Sir Thomas Edmonde M. P. It was held in Market Square Tuam. 'All honour to the Cloondarone people for their conduct here to-day. They showed displine and kept within the law and as long as they do so, they need not fear for the issue between themselves and Mrs. Bodkin'. Canton was moved from Tuam and succeeded by Rev. John Loftus as Administrator. Canton was appointed P.P. of Ballinakill (Letterfrack) in 1890 but then sent to Athenry in 1891 due to the fact there was not harmonious relations between himself and Archbishop MacEvilly. Reason for this was Canton's stance for tenant farmers, the G. A. A., and his Patronage to Cortoon Club, his old relationship with McHale. Agitation in the west was becoming heavier since the late 19th and into the earlier 20th centuries - on 30 November 1907 Canton wrote a strong letter to the Irish Independent stating that the people of Athenry were 'irate that the Independent and Herald were connecting names in the parish with the shooting of Mr. White-Blake of Hollypark'. One of the last committees Rev. Cannon Joseph Canton was on was a committee to assist with the construction of water and sewerage works for Athenry. In my own research I would like to add, that this may have been known as the Waterworks Committee which I hope to write about in the future. 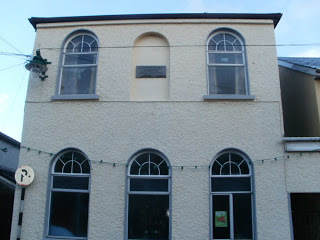 For a man who lived such an eventful life -Canton passed away on the 14th August 1920 in the Parochial House in Athenry. The then Archbishop Gilmartin of Tuam (See Stories of Athenry and the Irish Civil War 1922-1923 Part 4) presided at the Solemn Requiem Mass for the late Cannon Canton at Athenry, Rev. Bishop O'Dea - Bishop of Galway and 50 priests were present in the Choir! In the image at the very top of the article is Canton Memorial Hall which was built in 1932 in memory of Cannon Canton. The labourers who helped build Canton Memorial Hall were Christy Doherty of Northgate Street, and Paddy Corley of Bridge Street. It was a meeting place for many organisations throughout the past century but always used for its amenities such as cards, snooker and billiards. The hall's first trustess were Walter Walsh, Ballybacka for representing the farmer's interest; Timothy O'Regan, representing the town's people; and vested in the Catholic Church under the jurisdiction of the Archbishop. The hall today is still used as a meeting place and snooker is still played there. For further discussion of this topic check out the Canon Cantor thread on our Nostalgia Board.